When I was eleven or twelve years old my parents took a ride out to Levittown on Long Island to visit my mother’s oldest brother Martin, a retired New York City police officer. Though I didn’t realize it at the time, Levittown was then a brand-new community of 17,500 units of lower middle income, no-frills housing, one of several such projects constructed by the Levitt family during the housing boom following the end of the second world war. What I also didn’t realize was that Levittown was for whites only, not segregated by secret covenants but openly so in the public record and in the deeds themselves. Now, thanks to a study recently published by Richard Rothstein at the Economic Policy Institute, I also know that what happened in Levittown was for many decades common practice throughout the United States, sanctioned, indeed encouraged by the Federal Housing Administration inaugurated under the administration of Franklin Delano Roosevelt. 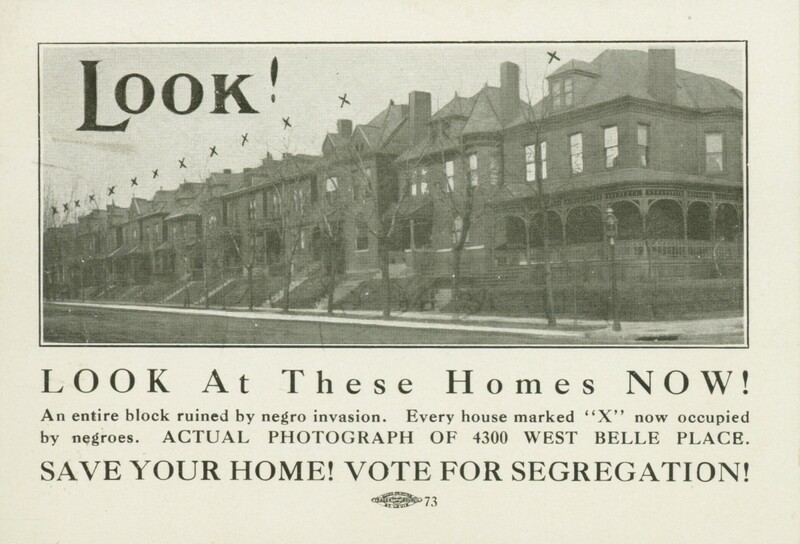 The FHA mandated that housing developments it stood behind — and for decades most new developments required FHA backing — had to be racially segregated in order to receive federal assistance. Shocking as this sounds simply as historical fact and moral shame, the consequences of this federal policy, along with similar state and municipal restrictions, are directly related to the present conditions of African Americans, including the recent killings of Michael Brown in Ferguson, Missouri and Eric Garner in Staten Island, New York. Home ownership is the single greatest source of wealth for most Americans. Appreciation in the value of the family residence is the financial springboard from which all the other economic and thence social achievements are made. It provides equity with which to send children to college and also makes available to them a nest egg with which they can purchase homes of their own and continue the cycle of wealth. Homeownership also comes with a tax write-off for interest paid on the mortgage, and interest can ultimately add up to more than the original principal. Renters receive no such tax write-off. African American income is 60% of white income. African-American wealth is 5% of white wealth. Both those percentages reflect deliberate public federal, state and municipal legislation and policies that were in effect from the early 1930s until very recent times. They also explain, along with other policies and regulations put into effect by cities and states throughout the United States, both North and South, why some neighborhoods are all-white and others all-black. Indeed, Prof. Rothstein maintains that any “mixed-race” neighborhood” is actually a neighborhood in transition, going either from black to white or white to black. New York City, where I live, is reputed to be the most diverse metropolitan area in the United States if not in the world. It is also said to be the most segregated of American cities. Initially, at the beginning of the 20th century, blacks and whites both lived in the so-called inner cities. Whites were lured out of those inner cities by the promise of affordable, racially homogeneous private housing developments in the suburbs with all the benefits, such as superior educational institutions, that come with that environment. African Americans were left behind, indeed restricted to neighborhoods that quickly deteriorated into ghettos and slums, with all the social disadvantages that come with that environment. Later, when whites rediscovered the positive aspects of city living, African Americans were forced out of their slums to make way for the gentrification process. Today, old suburbs like Ferguson, Missouri – originally white until it became convenient to rehouse urban African-Americans there — have become the new slums, sandwiched in between a white exurb and a white-gentrifying inner city. In order to preserve the racial and economic superiority first of the suburbs, now of the exurbs, zoning regulations were rewritten to prohibit the alteration of homes in white neighborhoods that would allow less affluent buyers and renters to move into those neighborhoods. Meanwhile, older suburbs into which African-Americans were crowded were rezoned as industrial areas, meaning houses could be subdivided and industry could locate there, insuring that public services like schools would be underfunded and that the same environment that had bred crime in the inner-city slums, whether inhabited by African-Americans, Irish, Jews, Italians or any other group, would provide the same social instability that gave rise to antisocial or even criminal behavior by some in those communities. Three of my mother’s brothers became New York City police officers. I don’t believe any of them finished high school. They got their jobs because they were white and Irish-American. After twenty years service they could retire with generous pensions. In the meantime their income allowed them to buy modest homes in white suburban communities. Their children enjoyed all the economic and social advantages of growing up in those communities and had career options available to them that their fathers never had, never mind what was available to African American children of that generation. The airwaves and other media in New York these days are full of self-congratulatory tales of public protests and the usual hand-wringing self-righteousness about “racism.” But racism, at least as we generally understand it, is not at the heart of what happened in Ferguson or Staten Island or Cleveland and before that to Trayvon Martin in Florida. “Racism,” like “anti-Semitism,” is a word we use all too frequently to avoid more serious thinking. We accept them as givens, we compare them to viruses that inhabit the body politic and its members, like herpes, becoming indolent but then breaking out again with frightening virulence. Rothstein makes reference to the use of the term “de facto segregation,” which is also a misrepresentation of the facts on the ground. Segregation, past and present, is not de facto, it’s de jure. It isn’t the result of a natural antipathy between people of African and non-African descent. Its roots are economic and social and anything but accidental. For the most part, so-called white people do not react to African-Americans out of racist attitudes, though those attitudes may be very negative and prejudiced as a result of the image portrayed of African Americans in our culture as well as because of valid personal experience. Someone who fears an African American in a situation in which they would not fear someone with a complexion similar to their own is not a racist on that account. Confusing racism with the consequences of deliberate public policy only exacerbates the problem and alienates the very people who most need and are usually willing to entertain a reasonable explanation for how we ended up in this mess. I don’t see any way out of it short of a massive initiative comparable to the denazification and economic resuscitation of Germany following the second world war. We undertook that project not for altruistic reasons but because we wanted Western Germany as an ally in our confrontation with the Soviet Union. We have no such motivation to make whole our African-American population. We no longer feel the immediacy of the holocaust of slavery. In fact, many among us are tired of what they perceive as an extended effort taken in the best of faith to afford African Americans full civic and social rights. When they see young people rioting on the streets of Ferguson, Missouri even some of the most liberal among us begin to wonder if their efforts were worth it. This is a reasonable reaction, not racism, to the lies we have been fed by our government, our educational institutions and our media. Because African Americans have not done what the Irish, Germans, Italians, Jewish Eastern Europeans and, more recently, Asians have done — i.e. enter into the mainstream after a period of social marginalization and even demonization — we have come to believe, if only subconsciously, that African Americans are a case apart. Without being racists we have come to accept the same kind of thinking that informs real racism. What we do not take into account, largely because there is a society-wide blackout on the kind of information Mr. Rothstein provides in his study, is that African-American experience in America is indeed a case apart, not because they have failed to respond to the opportunities other groups took advantage of when they became available but because those opportunities never did become available to them thanks to a century of deliberate public policy throughout United States. Instead of calling for more “conversations about race” and more marches against police brutality, it’s time we learned why the killing in Ferguson was inevitable and will continue to be so until we make up for deliberate, explicit federal policy (most of it inaugurated under FDR). The conditions that created Ferguson cannot be addressed without remedying a century of public policies that segregated our metropolitan landscape.